shields he received at the Megafest Awards. MASVINGO – Zimbabwe’s industrial base continues to shrink but from its ashes emerges Sternley Kondongwe who has established Jadecon Engineering, a fast growing construction company in Masvingo. 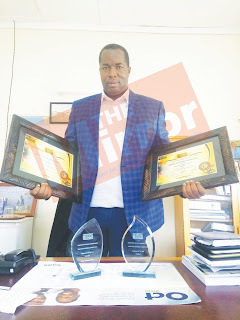 Kondongwe’s efforts were finally recognised at the inaugural Megafest Awards when he was adjudged Masvingo’s best industrialist for the year 2018. The event was held at the Great Zimbabwe Hotel at the outskirts of Masvingo on Friday night. Jadecon was also awarded Excellence of the Year trophy for its dedication to customer satisfaction, quality work and products. The first runner-up was Nick Manjoro of Multi Design. Jadecon Construction & Engineering (PVT) Ltd is one of the leading contractors in Masvingo Province. It covers all aspects of construction and engineering. The director Sternly Kondongwe takes personal pride in every project that Jadecon delivers, striving to always exceed Client & Customer’s expectations. The company has broadened its portfolio over the years from residential construction to tackling construction on a larger scale, venturing into schools/Institutions, industrial and commercial projects. The company has also diversified taking on projects not only in Masvingo province but other provinces like the Midlands and has the capacity and potential to cover the whole country. The company provides professional client-focused construction solutions. “Our commitment to outstanding job completion and superior safety performance has made us a partner of choice in the construction industry. We provide professional client-focused construction solutions. We go above and beyond on every project and deliver on our promises with integrity.” Said Kondongwe. The following are the company‘s various areas of operations. Drafting and designing- Drawing plans for all residential, educational, industrial, recreational and commercial facilities. Quantity Surveying -BOQs for any building plans. They also have an EMA licence to supply Aggregates Quarry stones, River and Pit sand and Gravel supplied in small and large quantities depending with your needs. Various Rural District Councils are satisfied with the work being undertaken by Jadecon Construction in terms of service provision and supply of Building materials.